Since 2013, the Open Access Team has been helping Cambridge researchers, funded by Research Councils UK (RCUK) and the consortium of biomedical funders which make up the Charity Open Access Fund (COAF), to meet their Open Access obligations. Both RCUK (now part of UKRI) and COAF have Open Access policies which have a preference for ‘gold’, i.e. the published work should be Open Access immediately at the time of publication. Implementing these policies has come at a significant cost. In this time, Cambridge has been awarded just over £10 million from RCUK and COAF to implement their Open Access policies, and the Open Access Team has diligently used this funding to maximum effect. Figure 1. Comparison of combined RCUK/COAF grant spend and available funds, April 2013 – March 2018. Initially, expenditure was slow which allowed the Open Access Team to maintain a healthy balance that could guarantee funding for almost any paper which met a few basic requirements. However, since January 2016 expenditure has gradually been catching up on the available funds which has made funding decisions more difficult (specifically Open Access deals tied to multi-year publisher subscriptions). In the first three months of 2018 average monthly expenditure on the RCUK block grant alone exceeded £160,000. We are quickly reaching the point where expenditure will outstrip the available grants. One technical change which has particularly affected our management of the block grants was RCUK’s decision last year to move away from a direct cash award (which could be rolled over year to year) to a more tightly managed research grant. In the past, carrying over underspend has given us some flexibility in the management of the RCUK funds, whereas the more restrictive style of research grant will mean that any underspend will need to be returned at the end of the grant period, while any overspend cannot be deferred into the next grant period. As we are now dealing with a fixed budget, the Open Access Team will need to ensure that expenditure is kept within the limits of the grant. This is difficult when we have no control over where or when our researchers publish. Funding from COAF (which is also managed as though it is a research grant) has generally matched our total annual spend quite closely, but the strict grant management rules have caused some problems, especially in the transition period between one grant and another. However, unlike RCUK, the Wellcome Trust will provide supplementary funding in addition to the main COAF award if it is exhausted, and the other COAF partners have similar procedures in place to manage Open Access payments beyond the end of the grant. Most of our expenditure (91%) goes on article processing charges (APCs), as perhaps one might expect, but the block grants are also used to support the staff of the Open Access Team (3%), helpdesk and repository systems (2%), page and colour charges (2%), and publisher memberships (1%) (where this results in a reduced APC). The majority of APCs we’ve paid go towards hybrid journals, which represent approximately 80% of total APC spend. So let’s take a look at which publishers have received the most funds. We’ve tried to match as much of our raw financial information we have to specific papers, although some of our data is either incomplete or we can’t easily link a payment back to a specific article, particularly if we look back to 2013-2015 when our processes were still developing. Nonetheless, the average APC paid over the last 5 years was £2,291 (inc. 20% VAT), but as can be seen from Table 1, average APCs have been rising year on year at a rate of 7% p.a., significantly higher than inflation. Price increases at this rate are not sustainable in the long term – by 2022 we could be paying on average £3000 per article. Table 1. Average APC by publication year of article (where known). 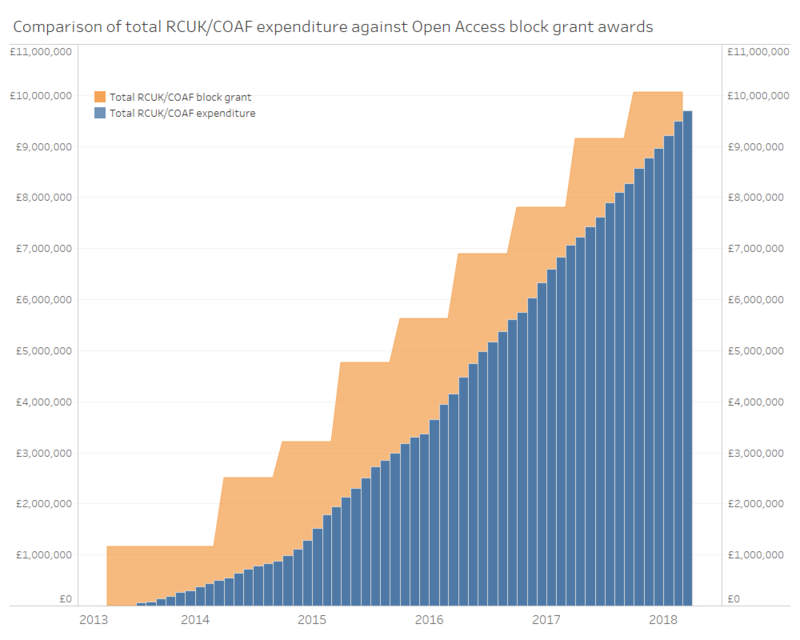 Elsevier has been by far the largest recipient of block grant funds, receiving 29.4% of all APC expenditure from the RCUK and COAF awards (over £2.5 million), though only accounting for 25.5% of articles. In the same time SpringerNature also received in excess of £1 million (which as we’ll see below has mostly been spent on two titles). With such a substantial set of data we can now begin to explore the relative value that each publisher offers. Take for example Taylor & Francis (£107,778 for 120 articles) compared to Wolters Kluwer (£119,551 for 35 articles). Both publishers operate mostly hybrid OA journals and yet the relative value is significantly different. What is so fundamentally different between publishers that such extreme examples as this should exist? Table 2. Top 20 publishers by combined total RCUK/COAF APC spend 2013-2018. Next, journal level metrics. The most popular journal that we pay APCs for is Nature Communications, followed closely by Scientific Reports. Both of these are SpringerNature titles, and indeed these two titles make up the bulk of our total APC spend with SpringerNature. Yet these two journals represent significantly different approaches to Open Access. Nature Communications, along with Cell and Cell Reports, are some of the most expensive routes to making research publications Open Access, whereas Scientific Reports and PLOS One sit at the lower end of the spectrum. It is interesting that we haven’t seen a particularly popular Open Access journal fill the niche between Nature Communications and Scientific Reports. Figure 2. APC number and total spend by journal. 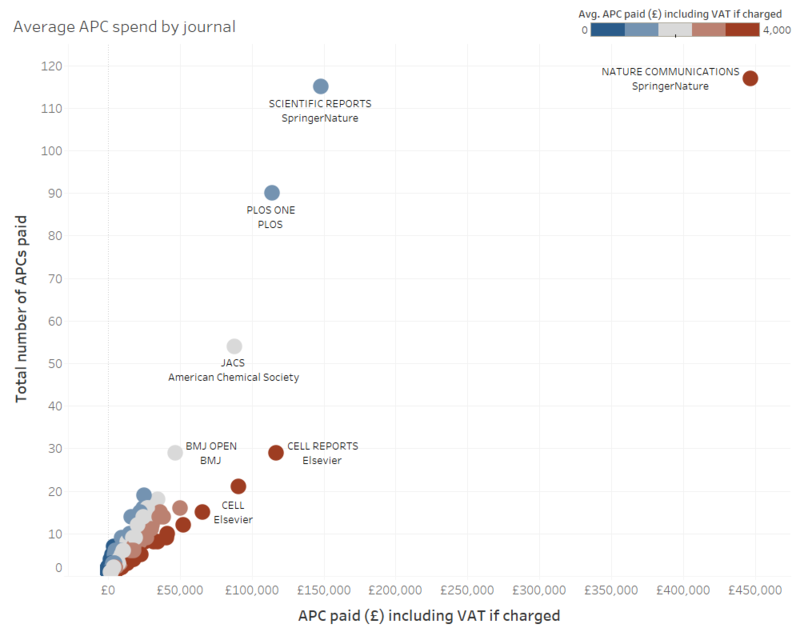 In the last five years, nearly £450,000 has been spent on articles published in Nature Communications. While the OA block grants have kept pace with overall expenditure so far, continuing monthly expenditure of £160,000 would risk overspending on the RCUK grant for 2018/19. To counter this possible outcome the University has agreed a set of funding guidelines to manage the RCUK (from now on known as Research Councils) and COAF awards. For Research Councils’ funded papers the new guidelines place an emphasis on fully Open Access journals and hybrid journals where the publisher is taking a sustainable approach to managing the transition to Open Access. 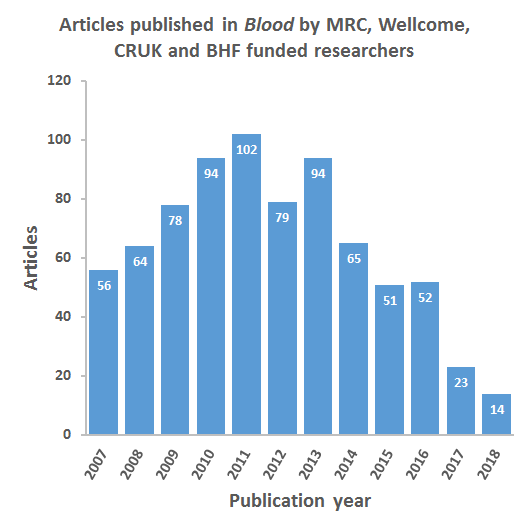 We’ve spent a lot of money over the last five years, yet it’s not clear that the influx of cash from RCUK and COAF has had any meaningful impact on the overall publishing landscape. Many publishers continue to reap huge windfalls via hybrid APCs, yet they are not serious about their commitment to Open Access. In the future, we’ll be demanding better deals from publishers before we support payments to hybrid journals so that we can effect a faster transition to a fully Open Access world. Publishers should embrace values of researchers & librarians and become more open, collaborative, experimental and disinterested. Academic leaders and institutions should do their bit in combating the metrics focus. Big Deals don’t save libraries money, what helps them is the ability to cancel journals. The green OA = subscription cancellations is only viable in a utopian, almost fully green world. There are serious issues in the supply chain of getting books to readers. And copyright arrangements in academia do not help scholarship or protect authors*. The programme for the conference included a mix of presentations, debates and workshops. The Twitter hashtag is #r2rconf. As is inevitable in the current climate, particularly at a conference where there were quite a few Americans, the shadow of Trump was cast over the proceedings. There was much mention of the political upheaval and the place research and science has in this. The conference opened with an impassioned speech by Mark Allin, the President and CEO of John Wiley & Sons, who started with the statement this was “not a time for retreat, but a time for outreach and collaboration and to be bold”. The talk was not what was expected from a large commercial publisher. Allin asked: “How can publishers act as advocates for truth and knowledge in the current political climate?” He mentioned that Proquest has launched a displaced researchers programme in reaction to world events, saying, “it’s a start but we can play a bigger role”. Allin raised the issue of access, noting that ResearchGate has more usage than any single publisher. He made the point that “customers don’t care if it is the version of record, and don’t care about our arcane copyright laws”. This is why people use SciHub, it is ease of access. He said publishers should not give up protecting copyright but must realise its limitations and provide easy access. Researchers are the centre of gravity – we need to help them spend more time researching and less time publishing, he says. There is a lesson here, he noted, suppliers should use “the divine discontent of the customer as their north star”. He used the example of Amazon to suggest people working in scholarly communication need to use technology much better to connect up. “We need to experiment more, do more, fail more, be more interconnected” he said, where “publishing needs open source and open standards” which are required for transformational impact on scholarly publishing – “the Uber equivalent”. Allin called the situation, saying publishing may have gone online but how much has the internet really changed scholarly communication practices? The page is still a unit of publishing, even in digital workflows. It shouldn’t be, we should have a ‘digital first’ workflow. The question isn’t ‘what should the workflow look like?’, but ‘why hasn’t it improved?’, he said, noting that innovation is always slowed by social norms not technology. Publishers should embrace values of researchers & librarians and become more open, collaborative, experimental and disinterested. So what do publishers do? Publishers “provide quality and stability”, according to Kent Anderson, speaking on the second day (no relation to Rick Anderson) in his presentation about ‘how to cook up better results in communicating research’. Anderson is the CEO of Redlink, a company that provides publishers and libraries with analytic and usage information. He is also the founder of the blog The Scholarly Kitchen. Anderson made the argument that “publishing is more than pushing a button”, by expanding on his blog on ‘96 things publishers do’. This talk differed from Allin’s because it focused on the contribution of publishers. Anderson talked about the peer review process, noting that rejections help academics because usually they are about mismatch. He said that articles do better in the second journal they’re submitted to. During a discussion about submission fees, Anderson noted that these “can cover the costs of peer review of rejected papers but authors hate them because they see peer review as free”. His comment that a $250 journal submission charge with one journal is justified by the fact that the target market (orthopaedic surgeons) ‘are rich’ received (rather unsurprisingly) some response from the audience via Twitter. There were a couple of good points made by Anderson. He argued that one of the value adds that publishers do is training editors. This is supported by a small survey we undertook with the research community at Cambridge last year which revealed that 30% of the editors who responded felt they needed more training. There is good reason to expect that green OA will make people and libraries cancel their subscriptions, at least it will in the utopian future described by Rick Anderson (no relation to Kent Anderson), Associate Dean of University of Utah in his talk “The Forbidden Forecast, Thinking about open access and library subscriptions”. Anderson started by asking why, if we’re in a library funding crisis, aren’t we seeing sustained levels of unsubscription? He then explained that Big Deals don’t save libraries money. They lower the cost per article, but this is a value measure, not a cost measure. What the Big Deal did was make cancellations more difficult. Most libraries have cancelled every journal that they can without Faculty ‘burning down the library’, to preserve the Big Deal. This explains the persistence of subscriptions over time. The library is forced to redirect money away from other resources (books) and into serials budget. The reason we can get away with this is because books are not used much. The wolf seems to be well and truly upon us. There have been lots of cancellations and reduction of library budgets in the USA (a claim supported by a long list of examples). The number of cancellations grows as the money being siphoned off book budgets runs out. Anderson noted that the emergence of new gold OA journals doesn’t help libraries, this does nothing to relieve the journal emergency. They just add to the list of costs because it is a unique set of content. What does help libraries is the ability to cancel journals. Professor Syun Tutiya, Librarian Emeritus at Chiba University in a separate session noted that if Japan were to flip from a fully subscription model to APCs it would be about the same cost, so that would solve the problem. Anderson said that there is an argument that “there is no evidence that green OA cancels journals” (I should note that I am well and truly in this camp, see my argument). Anderson’s argument that this is saying the future hasn’t happened yet. The implicit argument here is that because green OA has not caused cancellations so far means it won’t do it into the future. Library money is taxpayers’ money – it is not always going to flow. There is much greater scrutiny of journal big deals as budgets shrink. Anderson argued that green open access provides inconsistent and delayed access to copies which aren’t always the version of record, and this has protected subscriptions. He noted that Green OA is dependent on subscription journals, which is “ironic given that it also undermines them”. You can’t make something completely & freely available without undermining the commercial model for that thing, Anderson argued. So, Anderson said, given green OA exists and has for years, and has not had any impact on subscriptions, what would need to happen for this to occur? Anderson then described two subscription scenarios. The low cancellation scenario (which is the current situation) where green open access is provided sporadically and unreliably. In this situation, access is delayed by a year or so, and the versions available for free are somewhat inferior. The high cancellation scenario is where there is high uptake of green OA because there are funder requirements and the version is close to the final one. Anderson argued that the “OA advocates” prefer this scenario and they “have not thought through the process”. If the cost is low enough of finding which journals have OA versions and the free versions are good enough, he said, subscriptions will be cancelled. The black and white version of Anderson’s future is: “If green OA works then subscriptions fail, and the reverse is true”. Not surprisingly I disagreed with Anderson’s argument, based on several points. To start, there would need to have a certain percentage of the work available before a subscription could be cancelled. Professor Syun Tutiya, Librarian Emeritus at Chiba University noted in a different discussion that in Japan only 6.9% of material is available Green OA in repositories and argued that institutional repositories are good for lots of things but not OA. Certainly in the UK, with the strongest open access policies in the world, we are not capturing anything like the full output. And the UK is itself only 6% of the research output for the world, so we are certainly a very long way away from this scenario. In addition, according to work undertaken by Michael Jubb in 2015 – most of the green Open Access material is available in places other than institutional repositories, such as ResearchGate and SciHub. Do librarians really feel comfortable cancelling subscriptions on the basis of something being available in a proprietary or illegal format? Stephen Curry, Professor of Structural Biology, Imperial College London, spoke about “Zen and the Art of Research Assessment”. He started by asking why people become researchers and gave several reasons: to understand the world, change the world, earn a living and be remembered. He then asked how they do it. The answer is to publish in high impact journals and bring in grant money. But this means it is easy to lose sight of the original motivations, which are easier to achieve if we are in an open world. In discussing the report published in 2015, which looked into the assessment of research, “The Metric Tide“, Curry noted that metrics & league tables aren’t without value. They do help to rank football teams, for example. But university league tables are less useful because they aggregate many things so are too crude, even though they incorporate valuable information. Are we as smart as we think we are, he asked, if we subject ourselves to such crude metrics of achievement? The limitations of research metrics have been talked about a lot but they need to be better known. Often they are too precise. For example was Caltech really better than University of Oxford last year but worse this year? There is a greater pressure to publish rather than pressure to do good science. We should all take responsibility to change this culture. Assessing research based on outputs is creating perverse incentives. It’s the content of each paper that matters, not the name of the journal. In terms of solutions, Curry suggested it would be better to put higher education institutions in 5% brackets rather than ranking them 1-n in the league tables. Curry calls for academic leaders and institutions to do their bit in combating the metrics focus. He also called for much wider adoption of the Declaration On Research Assessment (known as DORA). Curry’s own institution, Imperial College London, has done so recently. Curry argued that ‘indicators’ would be a more appropriate term than ‘metrics’ in research assessment because we’re looking at proxies. The term metrics imply you know what you are measuring. Certainly metrics can inform but they cannot replace judgement. Users and providers must be transparent. I sat on a panel to discuss copyright with a funder – Mark Thorley, Head of Science Information, Natural Environment Research Council , a lawyer – Alexander Ross, Partner, Wiggin LLP and a publisher – Dr Robert Harington, Associate Executive Director, American Mathematical Society. My argument** was that selling or giving the copyright to a third party with a purely commercial interest and that did not contribute to the creation of the work does not protect originators. That was the case in the Kookaburra song example. It is also the case in academic publishing. The copyright transfer form/publisher agreement that authors sign usually mean that the authors retain their moral rights to be named as the authors of the work, but they sign away rights to make any money out of them. I argued that publishers don’t need to hold the copyright to ensure commercial viability. They just need first exclusive publishing rights. We really need to sit down and look at how copyright is being used in the academic sphere – who does it protect? Not the originators of the work. Judging by the mood in the room, the debate could have gone on for considerably longer. There is still a lot of meat on that bone. (**See the end of this blog for details of my argument). There are serious issues in the supply chain of getting books to readers, according to Dr Michael Jubb, Independent Consultant and Richard Fisher from Something Understood Scholarly Communication. The problems are multi-pronged. For a start, discoverability of books is “disastrous” due to completely different metadata standards in the supply chain. ONIX is used for retail trade and MARC is standard for libraries, Neither has detailed information for authors, information about the contents of chapters, sections etc, or information about reviews and comments. There are also a multitude of channels for getting books to libraries. There has been involvement in the past few years of several different kinds of intermediaries – metadata suppliers, sales agents, wholesalers, aggregators, distributors etc – who are holding digital versions of books that can be supplied through the different type of book platforms. Libraries have some titles on multiple platforms but others only available on one platform. There are also huge challenges around discoverability and the e-commerce systems, which is “too bitty”. The most important change that has happened in books has been Amazon, however publisher e-commerce “has a long way to go before it is anything like as good as Amazon”. Fisher also reminded the group that there are far more books published each year than there are journals – it’s a more complex world. He noted that about 215 [NOTE: amended from original 250 in response to Richard Fisher’s comment below] different imprints were used by British historians in the last REF. Many of these publishers are very small with very small margins. Jubb and Fisher both emphasised readers’ strong preference for print, which implies that much more work needed on ebook user experience. There are ‘huge tensions’ between reader preference (print) and the drive for e-book acquisition models at libraries. The situation is probably best summed up in the statement that “no-one in the industry has a good handle on what works best”. Current access control is not functional in the world we live in today. If you ask users to jump through hoops to get access off campus then your whole system defeats its purpose. That was the central argument of Tasha Mellins-Cohen, the Director of Product Development, HighWire Press when she spoke about the need to improve access control. Mellins-Cohen started with the comment “You have one identity but lots of identifiers”, and noted if you have multiple institutional affiliations this causes problems. She described the process needed for giving access to an article from a library in terms of authentication – which, as an aside, clearly shows why researchers often prefer to use Sci Hub. She described an initiative called CASA – Campus Activated Subscriber-Access which records devices that have access on campus through authenticated IP ranges and then allows access off campus on the same device without using a proxy. This is designed to use more modern authentication. There will be “more information coming out about CASA in the next few months”. Mellins-Cohen noted that tagging something as ‘free’ in the metadata improves Google indexing – publishers need to do more of this at article level. This comment was responded with a call out to publishers to make the information about sharing more accessible to authors through How Can I Share It? Mellins-Cohen expressed some concern that some of the ideas coming out of RA21 Resource Access in 21st Century, an STM project to explore alternatives to IP authentication, will raise barriers to access for researchers. It is always interesting to have the mix of publishers, intermediaries, librarians and others in the scholarly communication supply chain together at a conference such as this. It is rare to have the conversations between different stakeholders across the divide. In his summary of the event, Mark Carden noted the tension in the scholarly communication world, saying that we do need a lively debate but also need to show respect for one another. So while the keynote started promisingly, and said all the things we would like to hear from the publishing industry, there is still the reality that we are not there yet. And this underlines the whole problem. This interweb thingy didn’t happen last week. What has actually happened to update the publishing industry in the last 20 years? Very little it seems. However it is not all bad news. Things to watch out for in the near future include plans for micro-payments for individual access to articles, according to Mark Allin, and the highly promising Campus Activated Subscriber-Access system. Danny Kingsley attended the Researcher to Reader conference thanks to the support of the Arcadia Fund, a charitable fund of Lisbet Rausing and Peter Baldwin. In my presentation, I spoke about the children’s campfire song, “Kookaburra sits in the old gum tree” which was written by Melbourne schoolteacher Marion Sinclair in 1932 and first aired in public two years later as part of a Girl Guides jamboree in Frankston. Sinclair had to get prompted to go to APRA (Australasian Performing Right Association) to register the song. That was in 1975, the song had already been around for 40 years but she never expressed any great interest in any propriety to the song. Marion Sinclair died in 1988, the song went to her estate and Norman Lurie, managing director of Larrikin Music Publishing, bought the publishing rights from her estate in 1990 for just $6100. He started tracking down all the chart music that had been printed all over the world, because Kookaburra had been used in books for people learning flute and recorder. In 2007 TV show Spicks and Specks had a children’s music themed episode where the group were played “Down Under” and asked which Australian nursery rhyme the flute riff was based on. Eventually they picked Kookaburra, all apparently genuinely surprised when the link between the songs was pointed out. There is a comparison between the music pieces. Two years later Larrikin Music filed a lawsuit, initially wanting 60% of Down Under’s profits. In February 2010, Men at Work appealed, and eventually lost. The judge ordered Men at Work’s recording company, EMI Songs Australia, and songwriters Colin Hay and Ron Strykert to pay 5% of royalties earned from the song since 2002 and from its future earnings. In the end, Larrikin won around $100,000, although legal fees on both sides have been estimated to be upwards $4.5 million, with royalties for the song frozen during the case. Gregory Ham was the flautist in the band who played the riff. He did not write Down Under, and was devastated by the high profile court case and his role in proceedings. He reportedly fell back into alcohol abuse and was quoted as saying: “I’m terribly disappointed that’s the way I’m going to be remembered — for copying something.” Ham died of a heart attack in April 2012 in his Carlton North home, aged 58, with friends saying the lawsuit was haunting him. This case, I argued, exemplifies everything that is wrong with copyright.